Today was our first chance to see how Bolton had fared from the big midweek storm. 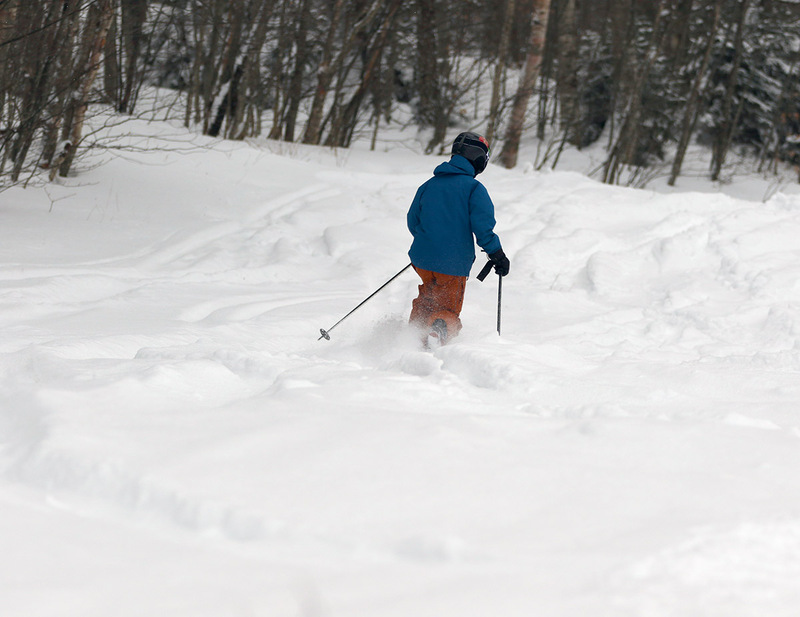 Numbers wise, they’d picked up almost four feet of snow from the initial round of precipitation, but as we’d seen at Stowe on Thursday, the snow was fairly dense and more difficult to ski in the lower elevations. The mountain had reported another 5 inches overnight to top of the previous snow, so that was quite encouraging in terms of setting up some fresh powder skiing. We parked at Timberline (~1,500’), but immediately worked our way up toward the Vista Summit (~3,150’) to see how the snow was skiing in the highest elevations. Up at the Timberline Summit (~2,500’) the snow was skiing well and the new powder was fairly dry, but it quickly began to get thicker as we descended to the village area (~2,150’). Once we reached the Vista Summit, we certainly found the best conditions of the morning – even the headwall of Cobrass was skiing pretty well. There were some clouds around, but we’d broken out into the sun at the top of Vista and it was quite a sight. The cumulus clouds off in the distance looked much more like something one would see in summer vs. winter, and presumably spoke to the interesting weather pattern that had recently brought about the big snows. We made a long descent back to the Timberline Base to have an early lunch, and skied some of the Villager Trees along the way. We hiked for some extra turns in there with the boys, and the powder was OK at first, but after a few hundred vertical we were getting down into the elevations where the new powder wasn’t as dry, and the subsurface became harder since it was derived from wetter snow. We had a good lunch down at Timberline, which was rather deserted at first due to the early hour, then headed back up toward the main mountain. Based on what we’d found in our travels up to that point, there was no need to ski anything at Timberline since the snow on the upper mountain was so clearly superior. We got a call from Stephen that he was cycling the Vista Glades, and with the huge amounts of snow and colder temperatures up there, that seemed like a perfect choice. 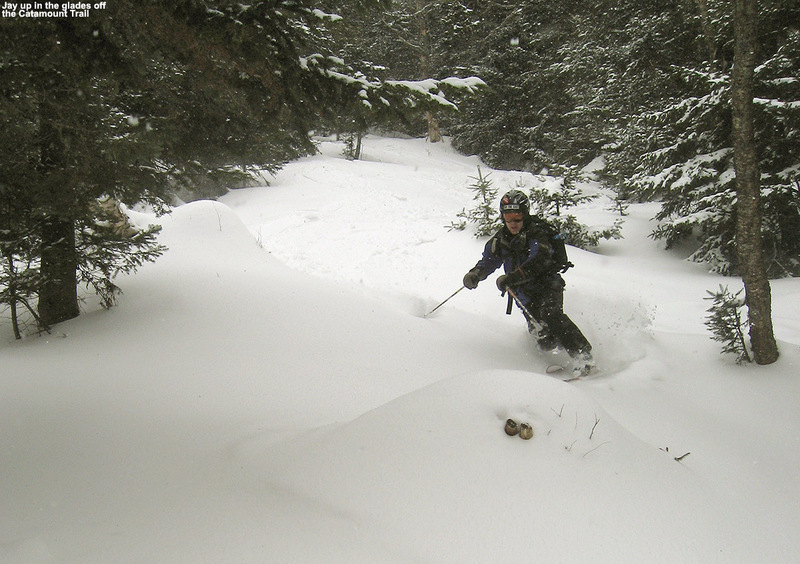 The Vista Glades were in excellent shape, with all the ledgy areas well covered thanks to the copious dense snow. E and the boys weren’t all that familiar with the Vista Glades since we don’t often ski them, but once they were in there and saw how much fun the skiing was, they agreed that it had been a great choice. 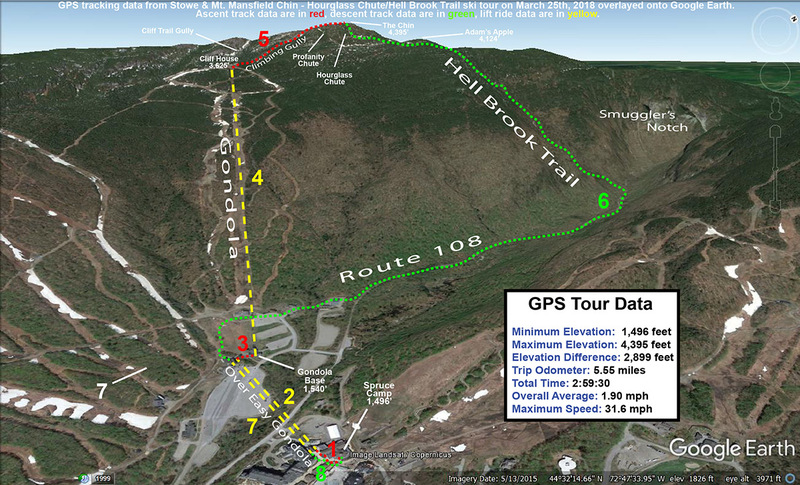 With upper elevation terrain in mind, we headed over to the Wilderness are next so we could check out Bolton Outlaw. As a testament to just how much snow, or likely how much dense snow and liquid equivalent had fallen, the top pitch of the Wilderness Lift Line actually had pretty decent coverage. That’s saying a lot. I’m not sure if it was actually open at that point, but it had been well traveled by plenty of skiers. Bolton Outlaw was excellent, and there wasn’t even a need to venture off into the powder on the sides because the trail itself was just so soft. We were definitely up in the elevations where the drier snow had fallen and the temperatures had never gone above freezing. 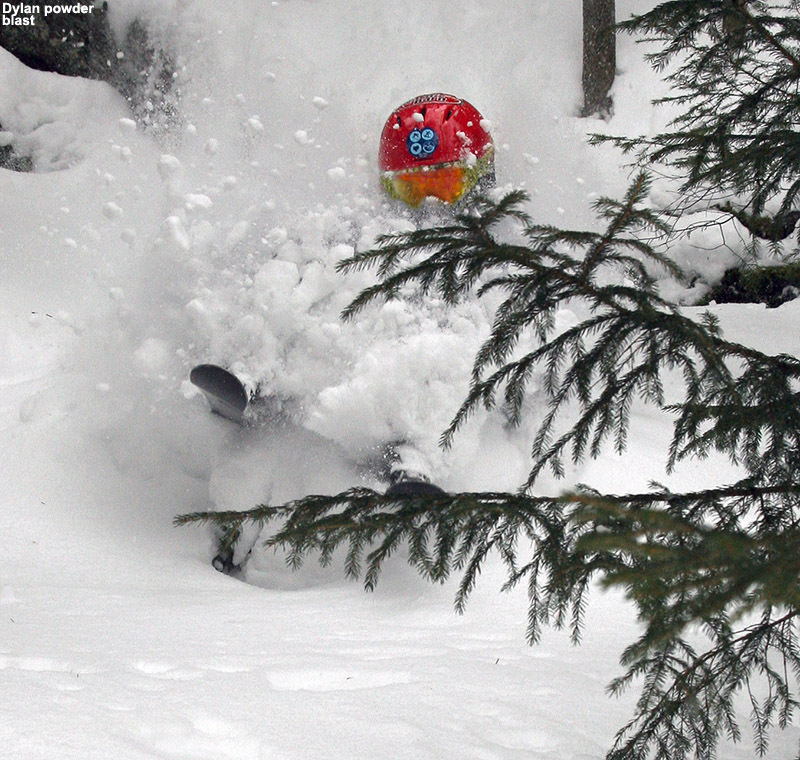 Below Bolton Outlaw, we skied the steep pitch of Cougar, which provided one of the best scenes from the day. Ty was skiing very fast due to the extra reliability of the snow surface, and he dropped into Cougar and skied the bumps at full tilt, followed by a huge hand in the air at the bottom. E said he’d clearly been watching plenty of Olympic ski action. Below the level of the Wilderness mid station, we played around in the various glades and found good powder down to a point. It was a gradual change in snow quality with elevation of course, but once we got down to around the 2,300’ elevation, the untracked snow had reached a stage of density/wetness that it was getting tough to ski. Fortunately, in the Wilderness area we were just about down to the base elevations and back on piste by that point, so it worked out pretty well. The snow quality and skier traffic were so good over at Wilderness that I would have been happy to simply stay there for the rest of the afternoon. 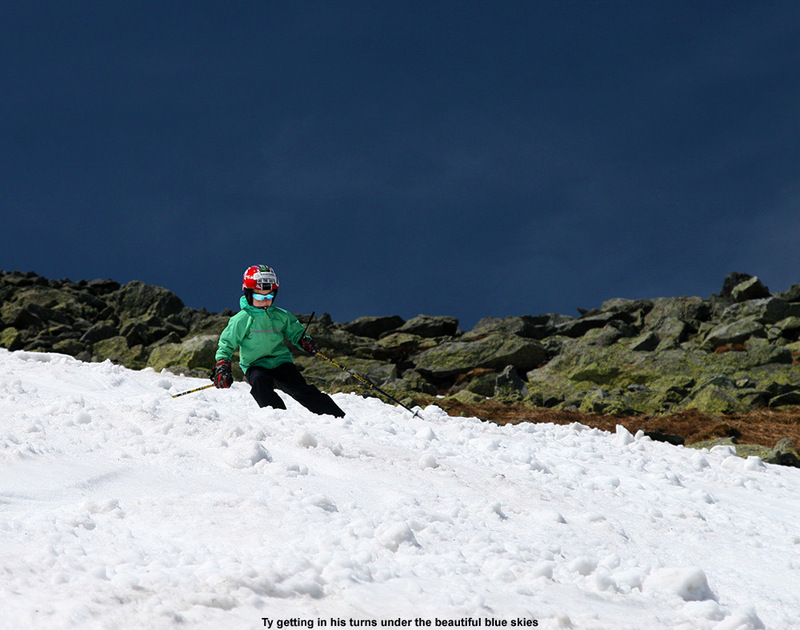 However, Ty eventually started to get tired (probably because he had been skiing pretty hard) and wanted to head home. In terms of the overall weather for the day, it was quite an eclectic mix: one minute we’d have bright sunshine, and then ten minutes later it would be snowing at a decent clip. As the afternoon wore on, the snowfall won out, and in the middle afternoon it was snowing at about an inch per hour for a while; I’d say it put down a quick half inch or so. The temperatures were excellent, being a few degrees above freezing down at the Timberline base elevations, and several degrees below freezing up at the summit areas. Even though I didn’t have a chance to get many pictures from that part of the day, the time spent over at Wilderness today was so good that it will probably end up being one of the highlights of the season. Today Stephen and Johannes joined us for some turns at “Stowequalmie” as it seemed. Down at the base elevations (~1,500’), the temperature was a couple of degrees above freezing, and the precipitation was mixed rain and snow, but not too far up in elevation it was all snow falling. 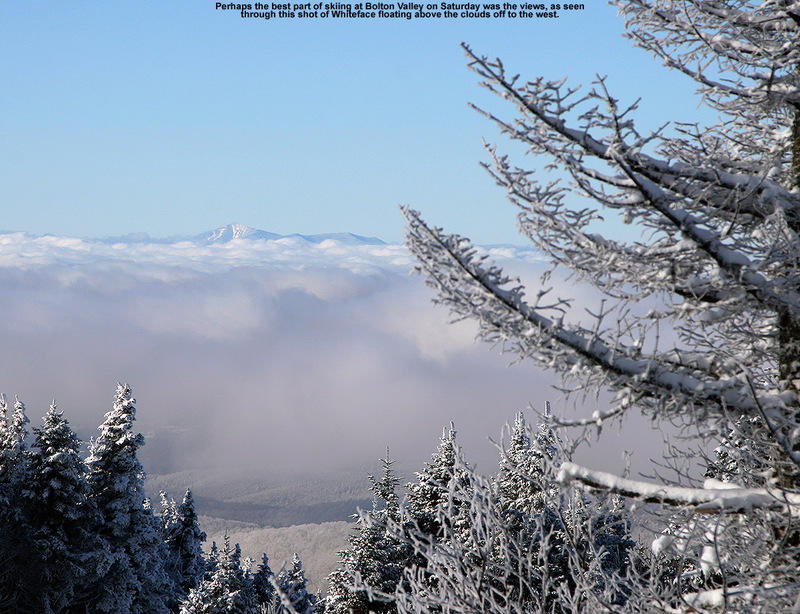 The uppermost elevations were in the clouds, so visibility was low up there, but those areas also had the driest snow. The middle elevations were sort of that sweet spot where visibility was up, and the snow was still nice. 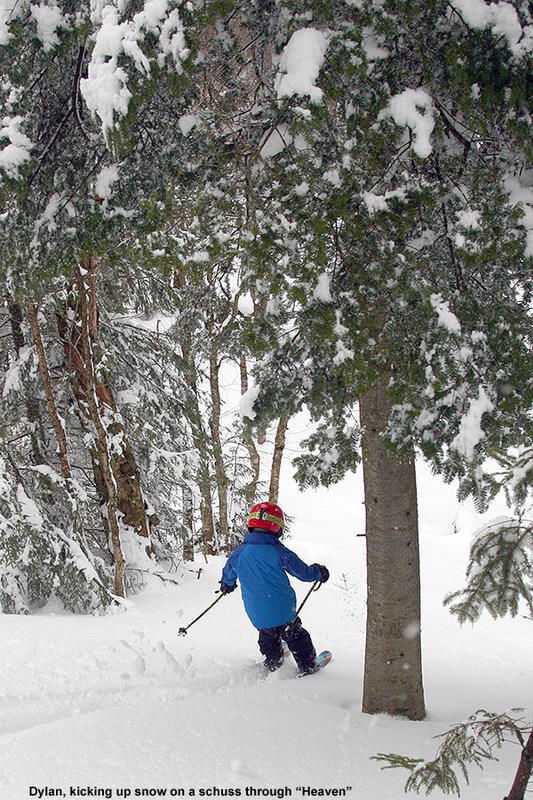 The lower ½ to ¼ of the mountain had great visibility, but the snow was fairly wet, so off piste skiing wasn’t quite as easy as it is with our more typical Vermont fluff. Some groomed areas on piste on the lower mountain had that wet pack snow that I’ve experienced on the lower elevations of Whistler Blackcomb. 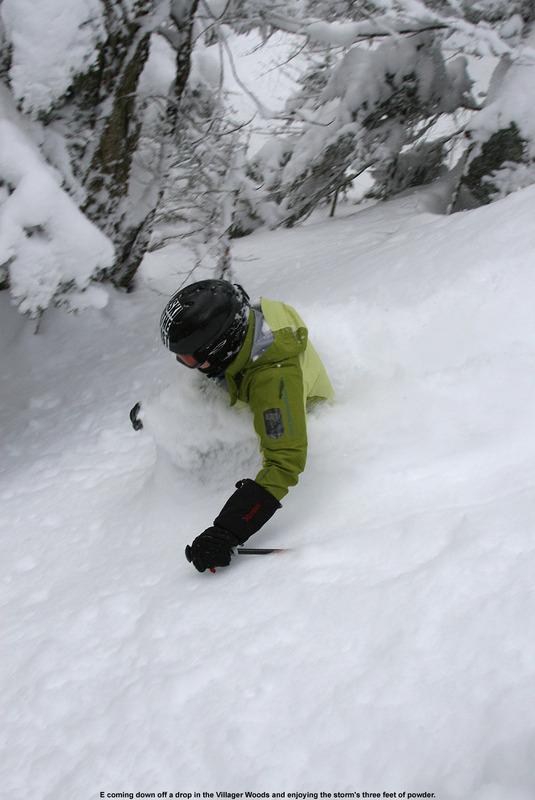 In terms of the powder in the middle and upper elevations, it was fairly dense, and boy was it deep! As others have mentioned, there were feet of it. The snowpack up there also seemed a bit upside down however. I think some denser snow had fallen on top of some drier snow from Wednesday, so it created that phenomenon. Off piste, it reminded me very much of a trip E and I had to Schweitzer back in 2001, where four feet of Cascade Concrete had fallen on the mountain and many people simply found themselves drowning in it because it was so difficult to ski. With our crew and the conditions, we didn’t spend much time off piste aside from playing in the snow off the edges of the trails, but we had a good time on the trials. Any issues of iciness or coverage were long buried, and it was great to see the mountain looking better as we approach March. Freddie’s Chute under the Sunny Spruce Quad is finally all covered, so we had a fun run down there. Ty really loved blasting the moguls on West Smuggler’s, since with the weather pattern we’d been in previously, it had probably been a couple of months since he’d skied moguls without at least some concern for hard snow or low coverage. 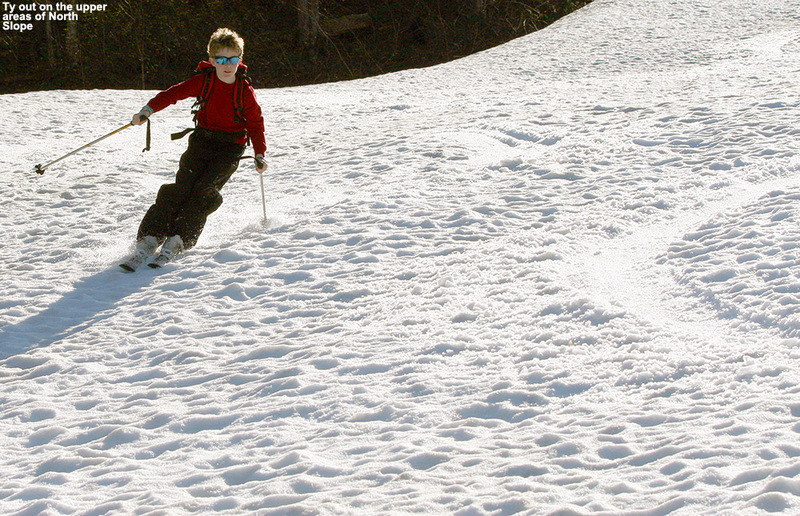 Stephen spied all the untracked snow sitting in the meadows area and wanted to try a run there. He didn’t initially know why E decline the chance to check it out, but she know what the untracked snow would be like down at that elevation. 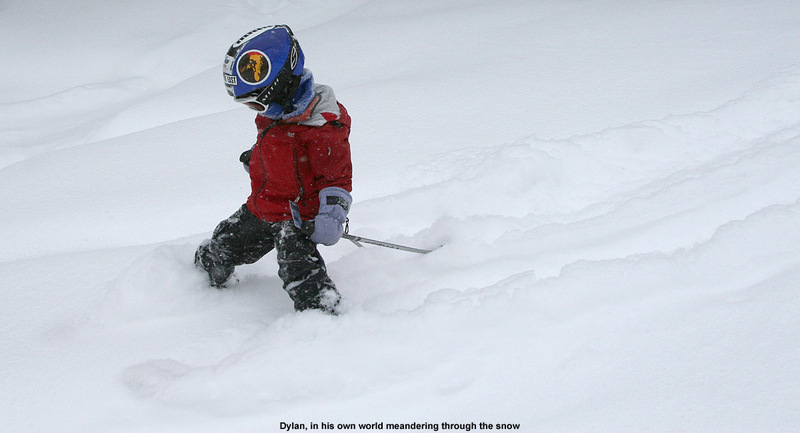 I brought them over and we had a lot of fun, but I think they learned how difficult it can be to ski deep, wet snow. We were up at Stowe this afternoon, and thanks to the foot or so of snow that they’d received in the previous few days, on piste conditions were certainly improved over what we’d experienced the prior couple of Sundays. I wouldn’t say it was a huge improvement though. I had a combined group of students with another parent, and we split for one run where I took the more advanced guys down the lower part of Hayride. It was a great challenge for them, steep with big bumps, but it was also still horribly icy. I had one student who is thinking of bumping up to the young advanced group, and based on his eagerness and ability to manage that nastiness with nice control, it looks like he should move up. The quad was still down, so the line at the gondola was very long, but lines were minimal at the double and triple. When we rode the Lookout Double, the Lookout trail seemed like it had decent snow quality, although there were still some areas of low coverage. I haven’t been on the double in a long time and I’d forgotten just how awesome the Lookout Trail actually is. Tuesday, 2/23/2012 Update: E and the boys were up at Stowe yesterday and conditions sounded similar, although they did enjoy the lack of weekend crowds. Perhaps this current system will really be the one to get the conditions back on track for those heavily used trials, since it sounds like there could be a good shot of liquid equivalent in it. 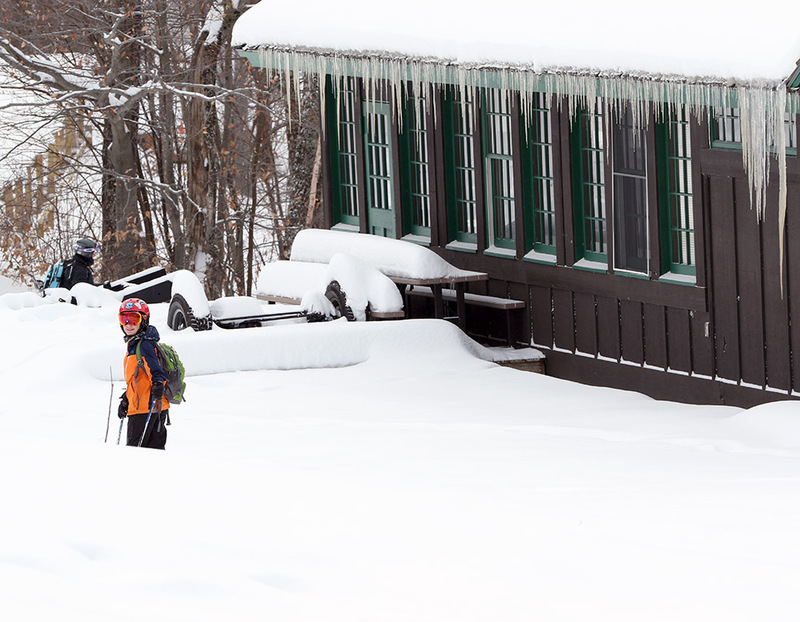 This morning we woke up to find that 4.9 inches of 2-3% H2O Champlain Powder™ had fallen at the house overnight. I’d expected the more typical inch or so that we’d been receiving with the impulses of moisture that were supported by the upslope flow, but conditions for snow growth had clearly improved and we were happy with the surprise. The Bolton-Stowe area was reporting 6-7 inches of new snow, so Ty and I headed up to Bolton to catch some of the morning freshies. It seemed like the skiing was going to be great with another half foot on to of the 10 inches of dense snow they’d picked up in the previous couple of days. Up at the Timberline base (~1,500’), I checked in a couple of spots and found 7 to 9 inches of new snow, which was a bit more than I’d expected based on the morning report. Ty played in the new snow for a bit while we hung out and waited for the lift to open. A few more people showed up, but the lineup was still only about 10 people when they started loading around 9:30 A.M.
We mixed up the skiing between on and off piste, and conditions were good, but not perfect. The main wrinkle was that there had been a little bit of icing later yesterday before the overnight fluff, so that sat atop the previous snow. The crust was thin and pretty inconsequential in terms of the actual skiing, but you could still hear it and the overall feel of the turns was therefore not as smooth as it might have been. Some places, such as areas in the trees that had some protection, were totally devoid of the crust, so those spots were especially sweet. 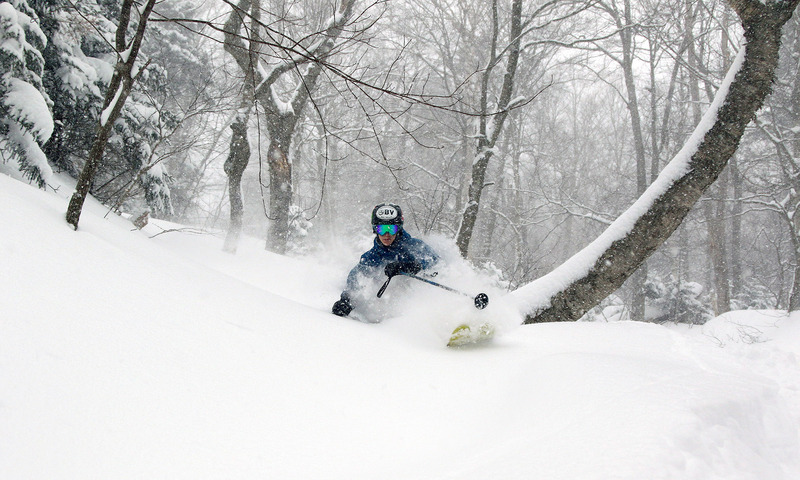 Today we headed up to Bolton to get in on some of the 10 inches of snow that they’d picked up in the past couple of days, and it certainly didn’t disappoint. 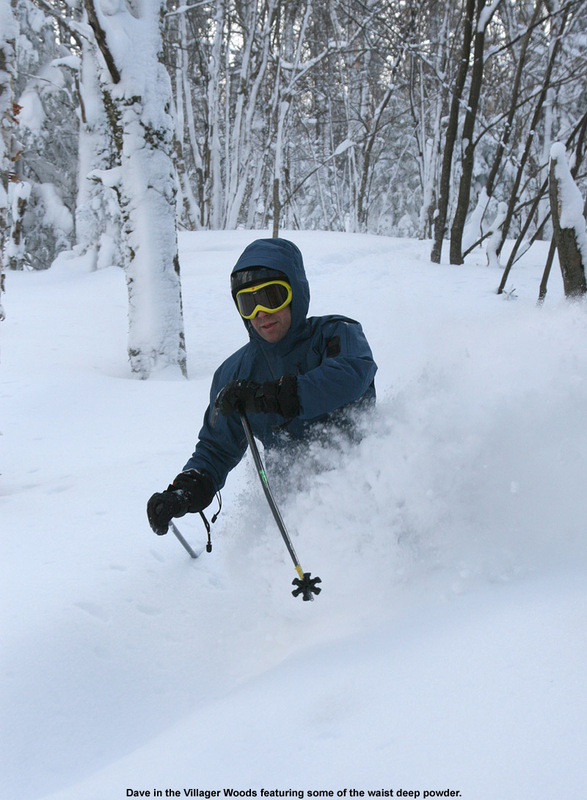 The snow was derived from the typical northwest upslope flow that has been supplying just about all the precipitation we’ve received in the past several weeks, but for once it wasn’t ultra fluffy Champlain Powder™. This snow actually had some substance to it. 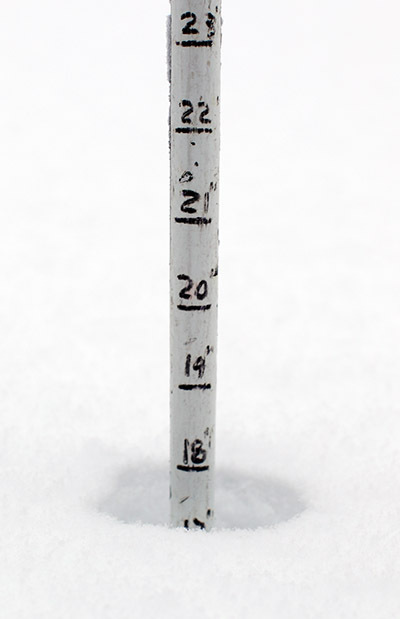 Unfortunately I don’t have any information on the amount of liquid contained in Bolton’s recent snowfall, but I do know that the past few days have dropped 0.42 inches of liquid equivalent at our house (495’), and 1.23 inches of liquid equivalent up at the stake on Mt. Mansfield (~3,700’). Since the Bolton Valley area has actually picked up more snow than Mt. Mansfield so far in this event, I’d estimate their liquid to be somewhere up around the number from the stake. So, even though we still haven’t been in on any big synoptic snowstorms in quite a while, I’d say that Bolton finally managed to sneak in a moderate resurfacing with 1”+ liquid equivalent. I noticed the effect of the new snow immediately in the morning when we hit Twice as Nice, which had been suffering with coverage a bit since it’s been allowed to bump up. You could just fly right through the bump lines without having to worry about whether or not there was a rock or patch of ice on the back side of a mogul. We were able to meet up with Stephen, Johannes, and Helena right after our first run, and everyone that hit Twice as Nice found it to be a blast. There are a few black pitches on the trail, but for the most part it’s a blue square trail so the moguls are great for learning. People seemed to know how nice it was because it was well skied, and a few of the icy spots started to reappear later in the day. Yesterday was presumably the bigger fresh powder morning on the trails, but traffic may have been light with some of the wind holds, because there were fresh lines left on the sides of the trails and we found hardly any tracks in the trees. We probably split the day about 50/50 in terms of time on and off piste, and had fun in the Showtime Glades, Enchanted Forest area, KP Glades, Villager Trees etc. Our last run of the day in the Villager Trees required some uphill traversing though the deep powder left from the past several weeks, and that was tough on Helena and Dylan since it was the end of the day. We got them though it though and they made some great turns once things were under way. 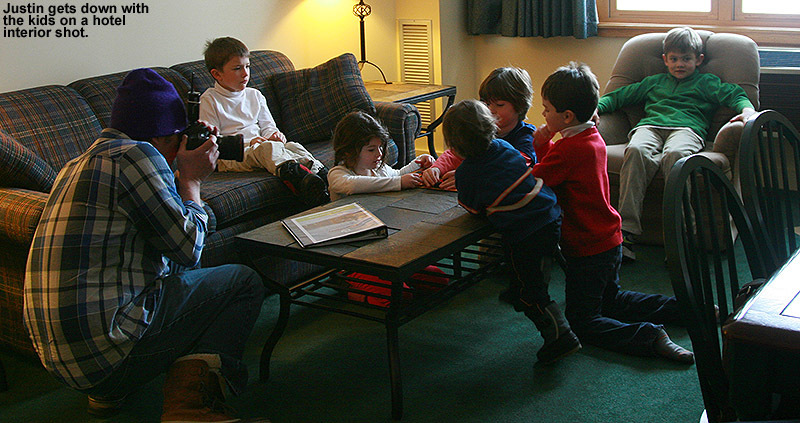 The fact that Stephen promised hot chocolate down at the lodge was a good motivator as well. Today I had some time to ski, and since I’d found such good snow in most of my excursions yesterday, I decided to put together a similar sort of session comprised of easy sidecountry/incountry. The bit of icing on the cake was that our snowfall from yesterday had kept up and we’d received 2.9 inches of new snow down at the house. 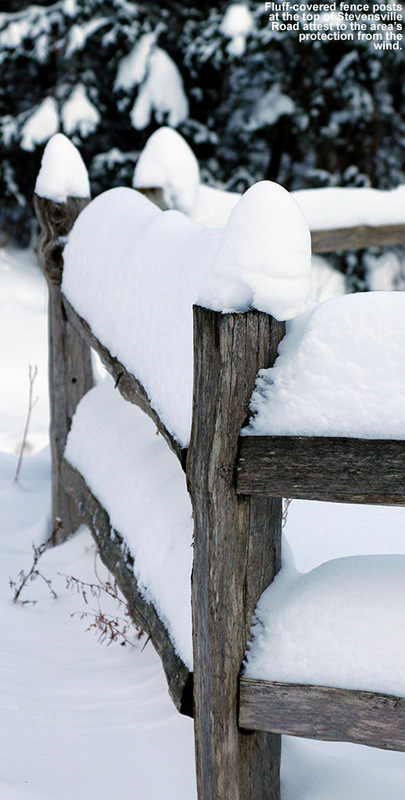 The accumulations didn’t seem to be too elevation-dependent for that event; the local mountains picked up in the range of 2 to 4 inches, with Bolton reporting 3 inches new in their morning report. Our region was in between weather systems today, so there were some breaks of sunshine when I arrived up at Timberline around mid morning. 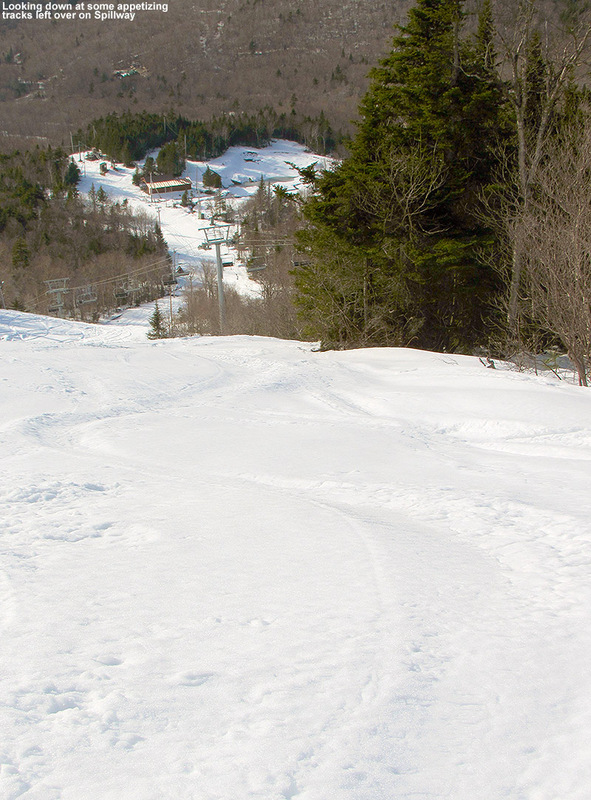 Fresh tracks were visible on the lower reaches of the Timberline terrain and things were looking good. Boarding the Timberline lift, my pass was checked by Josh from the marketing department; he recognized my name and said he’d be on the lookout for my pictures. 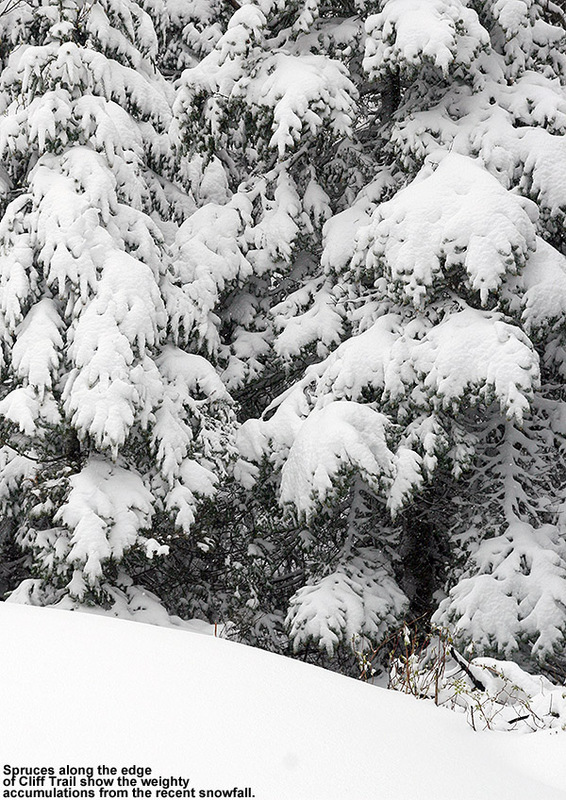 I was skiing alone, but hopefully I’d be able to find a few nice images to capture during my travels. I planned to finish off my day at Timberline, so I headed over toward the main base area to start things off there. Combined with the snow from yesterday, the few inches of new powder that fell last night really gave the snow conditions an invigorating shot. Heading down the side of Villager, I was immediately floating on the new snow, even in areas that had previously seen traffic. 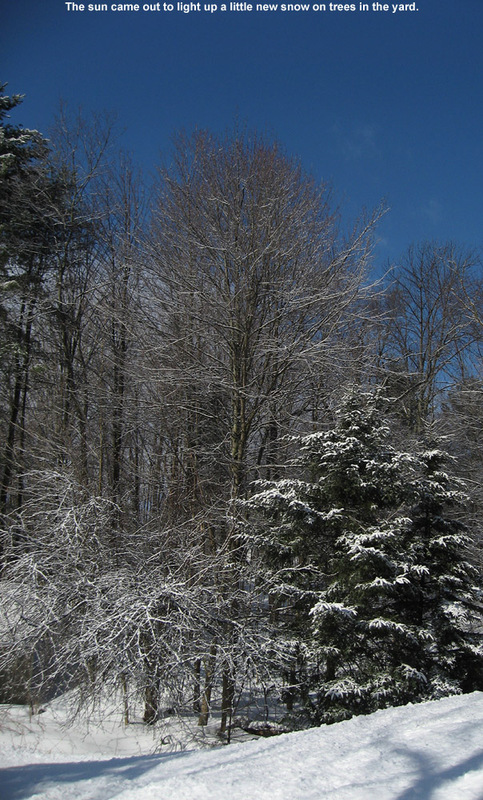 The snow was light and dry, but not quite the pixie dust that we sometimes get, so it really provided some substance. 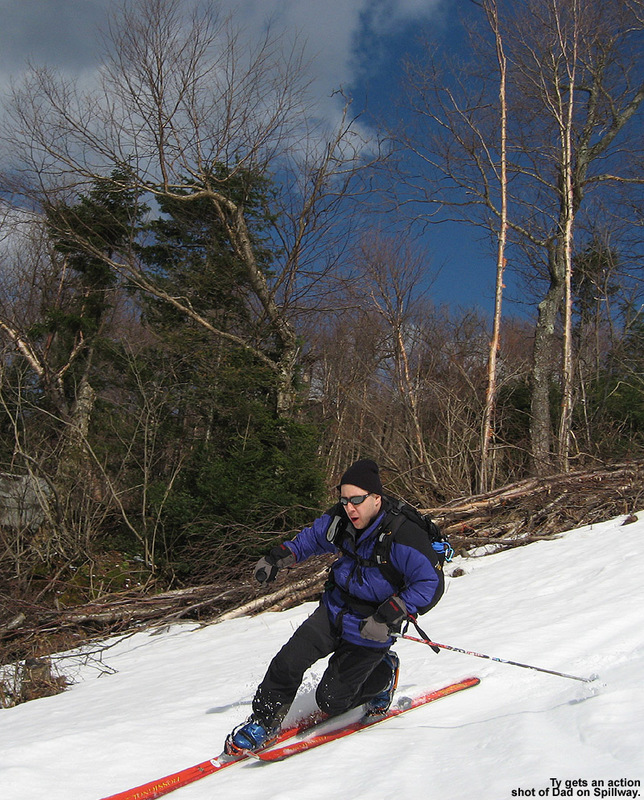 I saw plenty of untracked snow on the side of Lower Foxy, and couldn’t resist heading in that direction. That trip turned into a few Snowflake laps because I just couldn’t pull away. It took me a couple of rounds, but I was eventually able to home in on some shots in the Foxy trees that I’d wanted to try for a while. The powder was well protected and as bottomless as anything I’d found on the mountain throughout the weekend. Finally I pulled away from Snowflake and headed up Wilderness. From the top, I decided to catch some turns off the west face of Ricker Mountain, so I took the boot pack up the north side. Once I got farther up, I could see that the west side snow had experienced some effects from the wind (and sculpted some neat drifts as well). This was visually appealing, but looked like it would make for slabby skiing, so I skied the undisturbed powder on the north side. The turns were deep and the snow quality excellent. There were no tracks leading off the main access trail to the back side either, but that level of commitment wasn’t really in the plans for today’s outing. I got onto Upper Crossover and found excellent snow below the initial pitch – the wind had loaded it in there really well and provided more than just the few inches that had been reported. Along the way, I eventually found some good undisturbed terrain on the west face of Ricker Mountain, so I strapped on the skins and headed up for a run. The turns in that run set a new bar for steep and deep on the weekend, so deep that they actually threw me off for a minute and I messed up my line. Action shots up there would likely have produced some gems. I explored some of the thicker trees below Upper Crossover, and after roaming around for a while, I found one nice line that took me to the exit. I’d be hard pressed to find that one again though. Back down at Vista, I boarded the lift with Ed, a gentleman that works in the biology department at UVM. We skied a run on Cobrass, and while the steep headwall section was actually better than it often is, the rest of the trail was worse than usual. I found hard snow, ice, and bare patches, so I’d argue our extended dry spell is even catching up with Bolton’s level of traffic. The signs really do point to traffic being the issue, because once we were down below the Cobrass Lane junction, the base became soft and the fresh powder quite plentiful. Cobrass Lane was awesome, and Ed commented that all the trails should be like that. I joined Ed for part of another run before breaking off into the trees while he headed home for lunch. Instead of skinning up in the Villager Woods, I took the back side boot pack route. Whoever found that slot up through the ledges did a really nice job. The new snow and a little wind had reset much of the terrain, and the few added inches made the previously untouched terrain all the better. For my final run, I followed some of the new higher traverses out into the Twice as Nice Glades. I found some very steep ledgy areas that would be very cool in deep snow, but for now they are suffering from southern exposure combined with low elevation – there’s a crusty base below 6-12 inches of snow, and it’s just not enough for the pitch and tree spacing in that spot. I eventually wrapped around toward the west and found much better snow. It will be interesting to see what the upslope snowfall does over the next few days. 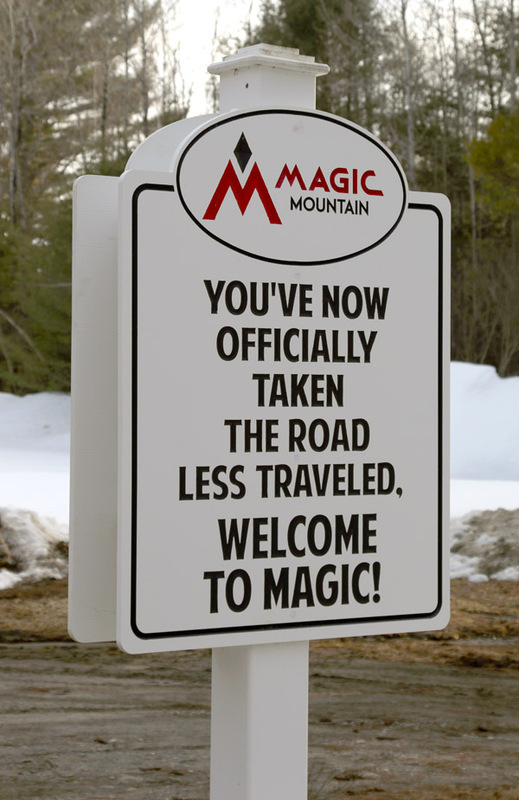 Ideally some of Bolton’s trails could use a nice resurfacing storm with a good shot of liquid, but we’ll have to take what Mother Nature delivers. Even with fluffy upslope snow, if enough comes down and the wind isn’t too rough to let it sit, it could help out the spots that need it.